Fred Gent's presentation reviewed an area which is vital for correct modelling solar phenomena driven by p-mode oscillations. Numerical modelling of wave phenomena in the solar atmosphere require information about the structure of magnetic fields therein. Such information is gleaned from magnetograms or from the analysis of Zeeman splittings or Stokes profiles. 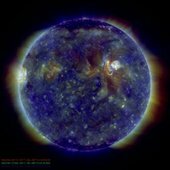 Improvements are expected as coronal seismology increases in maturity and can be used to infer information about the magnetic field. 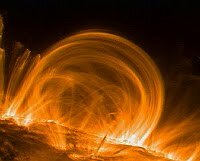 Even when armed with this range of sophisticated spectropolarimetric methods it is challenging to construct a numerical model of the magnetic fields pervading the solar atmosphere and which can be used for simulations of solar wave phenomena. For an example see Shelyag et al 2010. The seminar described an analytical method for constructing the magnetic field using the magnetohydrostatic balance equation. Currently we use a numerical approach based on the self-similarity assumption ensuring that the divergence of the constructed magnetic field is zero everywhere. This construction method was considered by Schlüter, A., & Temesváry, S. 1958 and Schüssler & Rempel 2005. The construction is shown below. The objective is to construct a 3D magnetic flux tube in magnetohydrostatic equilibrium within a realistic stratified solar atmosphere. The ambition is to extend this to model multiple flux tubes in quasi-equilibrium. The magnetic configuration is comprised of vertical flux tubes expanding with height in response to the fall in plasma pressure, and the adjustment of the plasma pressure and density distributions arise from the analytic solution of the pressure balance equation. 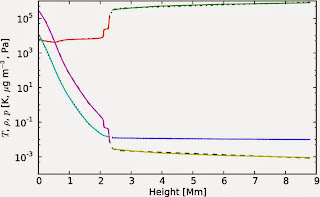 The plot above shows interpolated 1D fits to vertical hydrostatic atmospheric profiles (Vernazza et al. 1981; McWhirter et al. 1975, former up to 2.3 Mm, latter above 2.4 Mm): thermal pressure p (Pa) (dotted, light blue to blue), plasma density ρ ( μg m− 3) (dashed, purple to yellow) and temperature T ( K) (dash–dotted, red to green). Using these profiles it is possible to construct density and pressure profiles for a solar atmosphere in quasi-hydrostatic equlibrium. 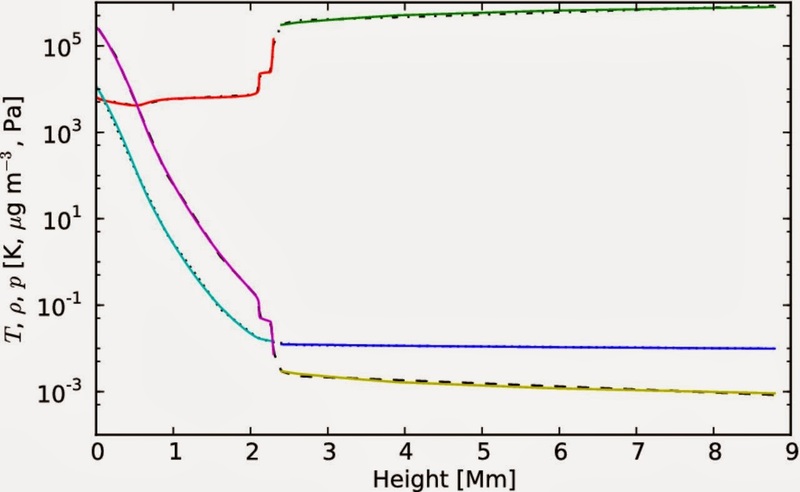 The profiles shown below are initially computed for a field free solar atmosphere the reference values for density and pressure, these are obtained from the measured data. The left-hand diagram above shows a 3D rendition of the magnetic flux tube including the magnetic field lines (reducing field strength, turquoise–blue). The rear and bottom surfaces display the thermal pressure (reducing, brown–yellow) and the isosurfaces depict plasma-β (purple–green ≃277,1,0.08,0.025and0.016). A vertical 2D slice of the magnetohydrostatic background magnetic pressure is illustrated in the middle image. Some representative field lines are overplotted in blue. The box (black, dotted) encloses the region magnified for display in the image on the right. 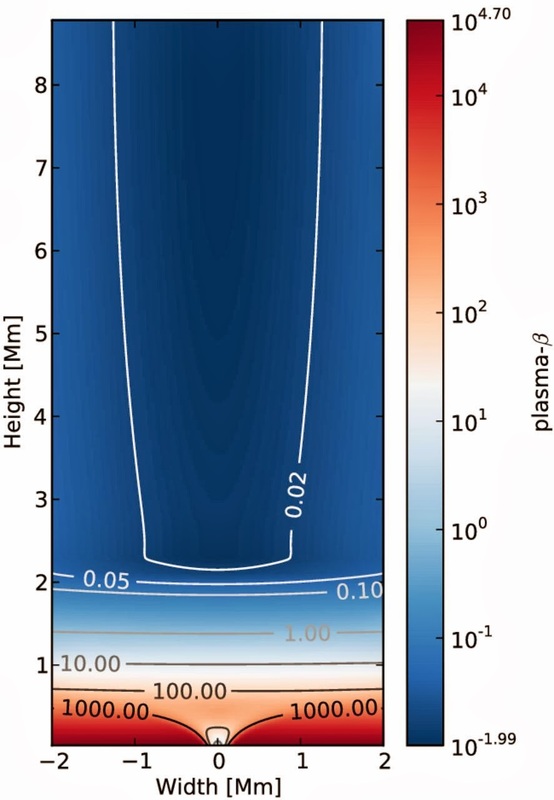 Solar Flux tubes are observed to remain relatively stable for up to a day or more, and one of the objectives here is to apply the model as the background condition for numerical studies of energy transport mechanisms from the surface to the corona. The diagram above shows a vertical 2D slice log profile of the magnetohydrostatic background (a) thermal pressure p (b) density ρ and (c) temperature T. Magnetic field lines (solid, blue) are overplotted in (a) and (b). The diagram below shows a vertical 2D slice of the log magnetohydrostatic background plasma-β: the ratio of thermal to magnetic pressure.